The Bren (from Brno, the Czechoslovak city of design, and Enfield, the location of the British Royal Small Arms Factory), usually called the Bren Gun, was a series of light machine guns adopted by Britain in the 1930s and used in various roles until 1991. While it is best known for its role as the British and Commonwealth forces' primary infantry light machine gun (LMG) in World War II, it was also used in the Korean War and saw service throughout the later half of the 20th century including the Falklands War and the 1991 Gulf War. The Bren was a modified version of a Czechoslovak-designed light machine gun, the ZB vz.26, which British Army officials had tested during a firearms service competition in the 1930s. The later Bren featured a distinctive curved box magazine, conical flash hider and quick change barrel. In the 1950s the Bren was rebarrelled to accept the 7.62x51mm NATO cartridge. Although fitted with a bipod, it could also be mounted on a tripod or vehicle-mounted. The Bren was replaced as the section LMG by the L7 General purpose machine gun (GPMG), a heavier belt-fed weapon. This was in turn supplemented in the 1980s by the L86 Light Support Weapon firing the 5.56x45mm NATO round, leaving the Bren only in use on some vehicles. As of November 2007, the Bren is still manufactured by Indian Ordnance Factories as the "Gun, Machine 7.62mm 1B". The British Army adopted it in 1935 following extensive trials of the Czechoslovak ZB vz.26 light machine gun which was manufactured in Brno, although the ZB vz. 26 was not actually submitted for the trials, a slightly modified model was submitted; the ZB vz. 27. A licence to manufacture was sought and the Czech design was modified to British requirements. The major changes were in the magazine and barrel. The magazine was curved in order to feed the rimmed .303 British cartridge, a change from the various rimless Mauser-design cartridges used to date, such as the 7.92 mm Mauser round. These modifications were categorised in various numbered designations, ZB vz. 27, ZB vz. 30, ZB vz. 32, and finally the ZB vz. 33, which became the Bren. Other weapons that were submitted for the trials were: the Madsen, Vickers-Berthier, Browning Automatic Rifle (BAR), and the Neuhausen KE7. The Vickers-Berthier was later adopted by the Indian Army and also saw extensive service in WWII. A gas-operated weapon, the Bren used the same .303 ammunition as the standard British rifle, the Lee-Enfield, firing at a rate of between 480 and 540 rounds per minute (rpm), depending on model. Each gun came with a spare barrel that could be quickly changed when the barrel became hot during sustained fire, though later guns featured a chrome-lined barrel which reduced the need for a spare. The Bren was magazine-fed, which slowed its rate of fire and required more frequent reloading than British belt-fed machine guns such as the larger .303 Vickers machine gun. However, the slower rate of fire prevented more rapid overheating of the Bren's air-cooled barrel, and the Bren was several pounds lighter than belt-fed machine guns. Because it was more easily portable, it could be fired on the move and from standing positions. The magazines also prevented the ammunition from getting dirty, which was more of a problem with the Vickers with its 250-round canvas belts. In general, the Bren was considered a reliable and effective light machine gun, though in North Africa it was reported to jam regularly unless kept very clean and free of sand. Its 30-round magazine was in practice usually filled with only 28 or 29 rounds to prevent jams and avoid wearing out the magazine spring, something that was common to other firearms as well. Care needed to be taken with magazine loading to ensure that the .303 cartridge rims did not overlap the wrong way, causing a jam. The rounds had to be loaded the correct way, each round ahead of the previous round. There was also a 100-round drum magazine available for the Bren used in the anti-aircraft role. The Bren had an effective range of around 600 yards (550 m) when fired from a prone position with a supported bipod. Initial versions of the weapon were sometimes considered too accurate because the cone or pattern of fire was extremely concentrated, resulting in multiple hits on one or two enemies, with other enemy soldiers going untouched. More than a few soldiers expressed a preference for worn-out barrels in order to spread the cone of fire among several targets. Later versions of the Bren addressed this issue by providing a wider cone of fire. 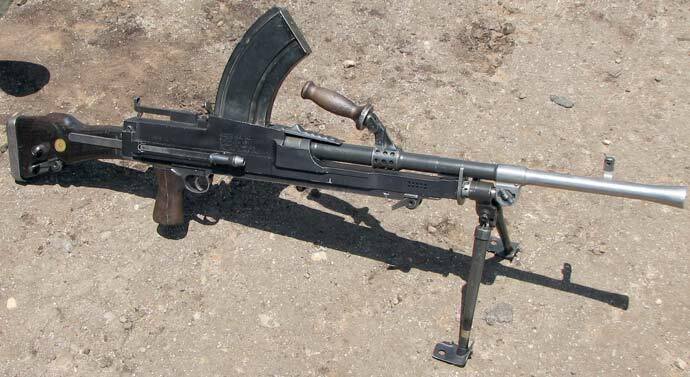 For a light machine gun of the interwar and early WWII era the Bren was about average in weight. On long marches in non-operational areas it was often partially disassembled and its parts carried by two soldiers. Writing about his experiences in the infantry during the Burma campaign, the author George MacDonald Fraser stated that one Bren gun was issued to each eight man section. One soldier would be the gunner and another would be his 'number two', who would carry extra ammunition and the spare barrel and change magazines in combat. The top-mounted magazine vibrated and moved during fire, making the weapon more visible in combat, and many Bren gunners used paint or improvised canvas covers to disguise the prominent magazine. Realising the need for additional section-level firepower, the British Army endeavoured to issue the Bren in great numbers, with a stated goal of one Bren to every four private soldiers. On occasion, a Bren gunner would use his weapon on the move supported by a sling, much like an automatic rifle, though generally the Bren was fired from the prone position using the attached bipod. Each British soldier's equipment normally included two magazines for his section's Bren gun, and every man would be trained to fire the Bren in case of an emergency, though these soldiers did not receive a Bren proficiency badge. The Bren was also used on many vehicles as well, including Universal Carriers to which it gave the alternative name "Bren Gun Carrier", on tanks, and armoured cars. However, on tanks it was not used in the co-axial role but on a pintle mount (rarely used). The co-axial requirement was filled by the Vickers or the BESA, the latter being another Czech machine gun design adopted by the British. It was popular with British troops who respected the Bren for its reliability and combat effectiveness; few would have swapped it for anything else. Many considered it the best light machine gun ever made. The quality of the materials used would often ensure minimal jamming. When the gun did jam or had some foreign object stuck in it, the operator could adjust the four-position gas regulator to feed more gas to the piston increasing the power to operate the mechanism. It was even said that all problems with the Bren could simply be cleared by hitting the gun, turning the gauge, or doing both. Note that the barrel needed to be unlocked and slid forward slightly to allow the regulator to be turned. Ironically, the Bren's direct ancestor, the Czechoslovak ZB vz. 26, was also used in WWII by German forces, including units of the Waffen SS. Many 7.92 mm ZB light machine guns were shipped to China where they were employed first against the Japanese in WWII, and later against UN forces in Korea, including British and Commonwealth units. Some ex-Chinese Czech ZB weapons were also in use in the early stages of the Vietnam conflict. The production of a 7.92 mm round model for the Far East was made by Inglis of Canada. With the British Army's adoption of the 7.62 mm NATO cartridge, the Bren was re-designed to 7.62 mm calibre, fitted with a new barrel and magazine, and continued in service. It was redesignated as the L4 Light Machine Gun and continued in British Army service into the 1990s. The change from a rimmed to rimless cartridge and nearly-straight magazine improved feeding considerably, and allowed use of 20-round magazines from the 7.62 mm L1A1 SLR (Self Loading Rifle). The conical flash hider was also lost in the transition, being replaced by the slotted type similar to that of the contemporary L1 rifle and L7 General Purpose Machine Gun. The magazine from the 7.62 mm version of the L4 also fitted the L1A1 however the magazine spring was not sufficient to the task of providing enough upward pressure to feed rounds correctly. Completion of the move to a 5.56 mm NATO cartridge led to the Bren/L4 being removed from the list of approved weapons and then withdrawn from service. The fact that Bren guns remained in service for so many years with so many different countries in so many wars says much about the quality of the basic design. The Mark III Bren remains in limited use with the Army Reserve of the Irish Defence Forces, although in most units it has been replaced by the 7.62 mm FN MAG (GPMG). The weapon was popular with the soldiers who fired it (known as Brenners) as it was light, durable and had a reputation for accuracy. The most notable use of the Bren by Irish forces was in the Congo during the 1960s, when the Bren was the regular army's standard section automatic weapon. From September 1937. The original Bren based on the Czechoslovak gun. Introduced 1941. A simpler version of the Mk 1. Produced by the Monotype Group through a number of component manufacturing factories. A shorter and lighter Bren made by Enfield from 1944 for the war in the East and for Airborne Forces. This was a coversion of the Mk1 whose main distinguishing feature was a shorter barrel. As with the Mk3 but this was a conversion of a Mk2. From 1958. L4 Brens can easily be identified by their straighter magazine. All L4s are chambered for 7.62x51mm NATO rimless ammunition.